It's been a busy past few months, but we're settling into life as a family. Happy Holidays from our little elf, Baby E.
Baby E finally made his appearance, nearly 2 weeks late. We are totally in love and can't wait to see the person you become, baby E.
Well, our due date has come and gone and I will admit I'm getting very impatient. 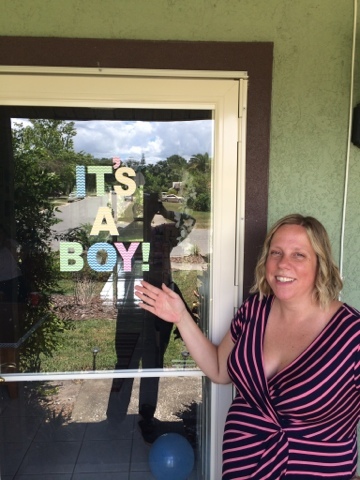 I just want to meet our little man so badly! I'm spending my days and evenings walking and bouncing on the yoga ball like crazy, basically anything to help usher the little guy into the world. 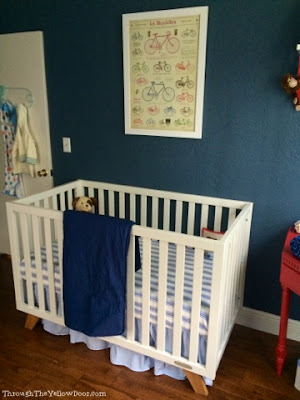 While I wait, I figured I would finally share the pictures of his nursery. As someone who was is obsessed with the movie E.T. 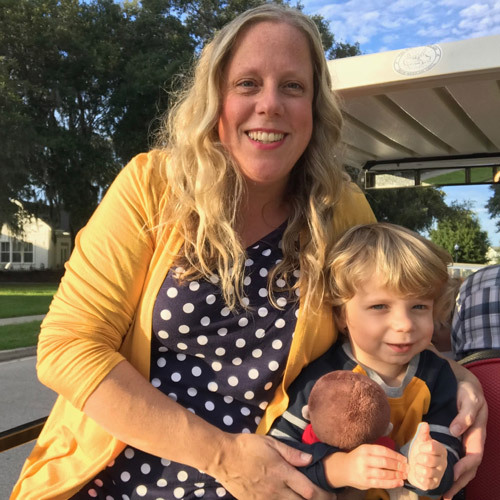 (and pretty much anything from the 1980's), I knew I was going to name my little boy Elliott long before my husband and I decided to have children. Thankfully, Matt was on-board with the idea! 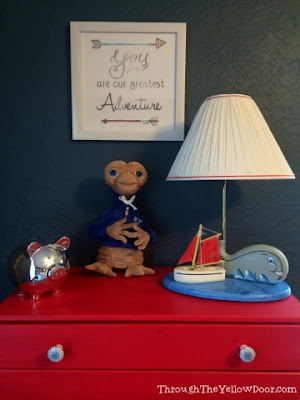 So, we went with a "retro" toy theme for the nursery. Navy and red are the primary colors with complementary shades of blue and white thrown in as well. At first, we were all a little nervous about painting the walls navy, "would it be too dark? ", but I decided to go for it anyway. Luckily, it's a small room with bright white crown molding (ceiling and baseboards) and 3 large windows - so there is actually plenty of light and it works well. Phew! After painting the room, I went to work painting a few pieces of furniture (which is totally safe by the way as long as you use zero fume paint, which is easily available at paint stores). 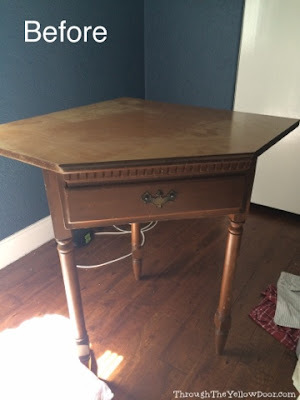 My Mother-in-Law (along with my Sister-in-Law and a family friend) actually found a cute corner table on the side of the road in Winter Park one day back in January. 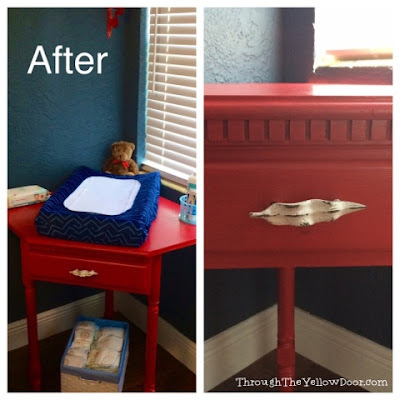 At the time, I wasn't sure where I would use the table, knowing it needed a bit of love, but eventually I realized it would make a great changing table because I'd be able to change the baby facing forward, not sideways. I never understood why all the changing tables were sideways facing anyway. Is it easier to change a baby if they are sideways? Time will tell... Anyway, I painted the table a classic fire engine red and added new hardware (which as my Dad pointed out is WAY too sharp and will need to be changed when Elliott is taller and moving around). 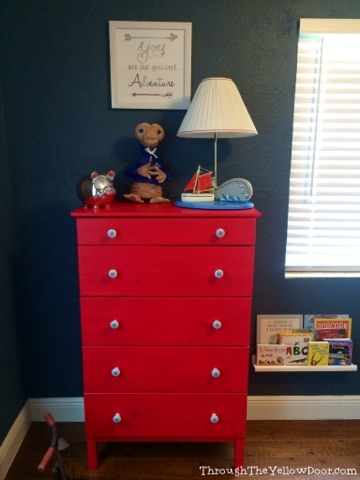 I also painted the dresser we purchased unfinished (aka: cheaper) from IKEA the same fire engine red and added new hardware (adorable blue and white compasses for drawer pulls). 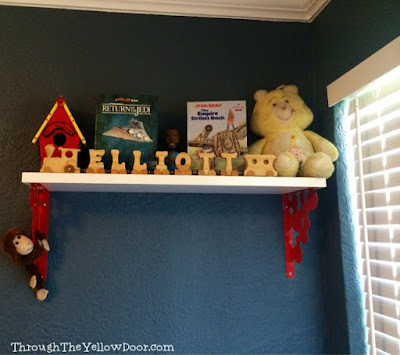 We put bookshelves (from IKEA) on the walls down low, so that eventually Elliott will be able to grab the books he wants all himself. 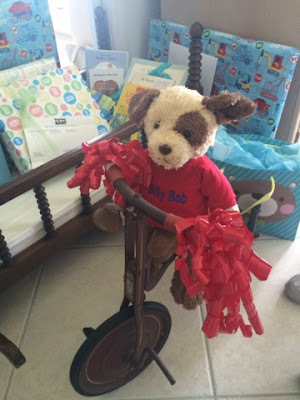 The too-cute-for-words tricycle that my Mother-in-Law found sits on the floor currently, just being perfect. Then we added a few shelves on the walls to hold the "retro" toys. 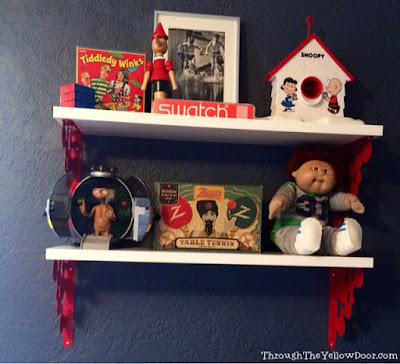 Matt contributed a Cabbage Patch Kid from his childhood (seriously, too cute!) and there are other retro things (E.T. toy, rubix cube, Snoopy Snowcone Machine, etc). 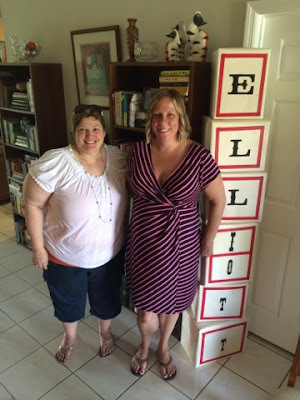 One of the gifts from my baby shower was the wooden toy train spelling out Elliott from my friend Tina, which you can see on this shelf below. Of course, I also have two vintage Star Wars pop-up books and a homemade Carebear from my childhood up there. We went with a white crib because I wanted something neutral that could be used again (if we are lucky enough to have more than one child). Above the crib is a print showcasing bicycles throughout the years. 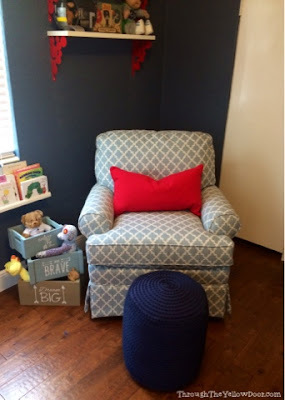 And finally, we decided on the most comfortable rocker/swivel chair from Buy Buy Baby and were able to choose the fabric. Winston (the dog, in case you forgot) has claimed that chair as his new favorite spot, it should be interesting when he has to share it with his brother! And, that's it. 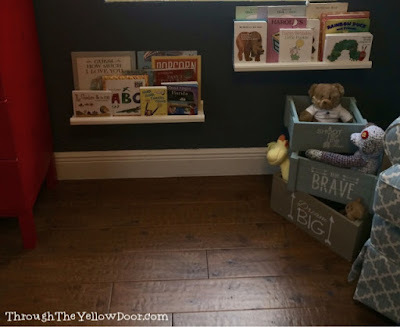 Nursery is all ready for the baby - if only he would come out and meet us! My Mom & Mother-in-Law are snowbirds, meaning they live here in Florida for the winter months. 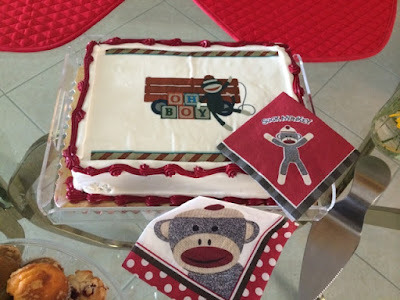 Before they left this "season" we wanted to have a small baby shower to celebrate our upcoming arrival. Their Florida friends were wonderful and put together the cutest little shower. I'm thinking of doing a "vintage" toy theme for the nursery, so I was thrilled with the sock monkey theme of the shower. Check out this adorable cake!! 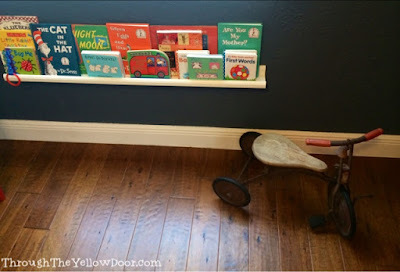 My Mother-in-Law was also able to find an old tricycle at an antique store and I couldn't be more excited to put it in the nursery! If you look closely at the picture you'll notice a stuffed animal (we can't decide if it's a monkey or a dog LOL) wearing a shirt that says "Billy Bob". That's the family name (my Dad is named William, so "Billy" and Matt's Dad is named Robert, so "Bob") everyone has taken to calling our little BOY!! 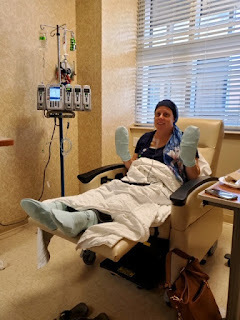 A little over a month later, my good friends put together another shower for me. 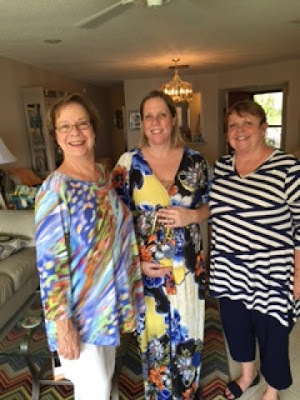 It was a smaller gathering with my favorite ladies in the world - and it was perfect! It was lovely and I'm so lucky to have great friends in my life that are willing to celebrate me and my little Elliott. 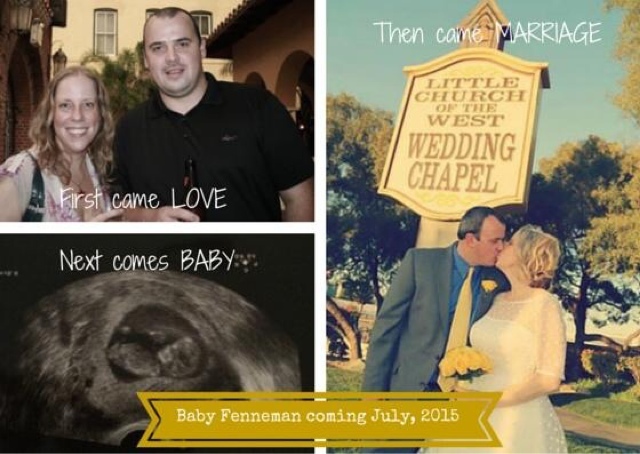 I thought it was time to share some exciting news. Possibly, the most exciting news of our lives - as this is something we've been wanting for a long time now.